An important look at how our political system developed and changed and the forces that compelled these changes. 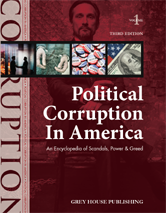 With its comprehensive coverage of this interesting topic, Political Corruption in America will prove to be a useful addition to the reference collections of all public libraries, university libraries, history collections, political science collections and high schools. 1804: Report on the historic impeachment trial of Judge John Pickering, the second such trial up to that time. 1873: Details the debate in the House on the censure motion against both Oakes Ames and James Brooks for their roles in The Credit Mobilier railroad scandal. 1876: Reports on an investigation into the fraud perpetrated by William Belknap's office, the announcement of Belknap's impeachment and resignation. 1890: Detail Stevenson Archer's fraud as Maryland's Treasurer and discusses Governor Jackson's removal of Archer. Also, a report of Archer's first day in prison. 1890: Highlights the shooting of William Goebel of Kentucky, who is reportedly the only major politician murdered in American history because of politics. 1900: Details the intrigue of Montana Senator William Clark's resignation due to electoral misconduct, and his reappointment by the Lt.Governor while the Governor was out of state. 1905: Report on Judge Charles Swayne's impeachment by the House, and his acquittal by the Senate on charges of corruption. 1906: Details of Senator Joseph Burton's resignation following allegations of illegally accepting compensation for services. 1912: Reports on the expulsion of Senator William Lorimer of Illinois on bribery charges–the first sitting Senator expelled on charges of political corruption. 1913: Details Judge Robert Archbald's fight against corruption charges and the Senate vote to impeach. And, a history of the impeachment of Federal officials up to that time. 1913: Details the vote to convict Governor William Sulzer of New York for financial improprieties and other corruption. 1931: Details the Senate debate of the actions of Senator Hiram Bingham of Connecticut, accused of illegal hiring practices. 1931: Heralds the conviction of Rep. Harry Rowbottom for accepting bribes in exchange for Federal appointments. 1936: Reports on Judge Halsted Ritter's impeachment vote and his removal from office, after he was convicted of accepting bribes in cases he was officiating over. 1939: A report on the investigation into Judge Martin Manton for taking bribes. As he was not a sitting judge, he could not be impeached. 1946: The conviction of Rep. James Curley from Massachusetts on mail fraud charges. 1958: Details the broadcast resignation of former New Hampshire Governor Sherman Adams due to accusations of accepting gifts From a Boston businessman. 1963: Illustrates powerful Majority Secretary of the Senate, Bobby Baker, and the depth of the corruption that led to his resignation. 1967: The censure of Senator Thomas Dodd of Connecticut for misuse of camp aign funds, and the final vote which led to his defeat in Connecticut's Democratic primary. 1973: A report on the 2nd Vice President to resign, and the first due to corruption. Agnew took bribes as governor of Maryland and was unable to pay taxes on the money he received. 1974: Reports on the conviction of Representative Frank Brasco of New York for accepting bribes in exchange for granting Post Office contracts to a known mobster. 1974: Details the conspiracy charges against Representative Bertram Podell for accepting bribes in exchange for helping an airline out of financial trouble. 1977: Outlines corruption and financial irregularities charges against Jimmy Carter's Director of OMB Bert Lance, while he was director of a Georgia bank. 1979: A report of the indictment of Rep. Buddy Leach for vote-buying. 1980/81: The unfolding ABSCAM (Arab Scam) scandal–breaking news of the FBI bribing Federal officials to loosen regulations on Arab sheiks, conviction and resignation of major players. 1984: These articles document the conviction of Idaho Representative George Hansen for filing false financial disclosure statements. 1989: Reports on Speaker of the House Jim Wright's resignation due to financial irregularities. He was the 4th Speaker to do so, but the first because of political corruption. 1989: This article discusses Judge Alcee Hastings being found guilty of directing a friend to solicit a bribe from an undercover FBI agent. 1997: Coverage of a press conference in which Vice President Al Gore denies accusations of breaking campaign finance laws. 1997: The Senate's vote to examine the Clinton/Gore campaign amid allegations of rampant violations of campaign finance laws. 2002: Reports on the House vote to expel Rep. James Traficant for bribery and racketeering. 2004: Scandal over “superlobbyist” Jack Abramoff, accused of lavish spending on his politician clients. 2005: Highlights the conspiracy of House Rep. and former war hero Randy Cunningham, for accepting million of dollars in bribes for major defense contracts. 2006: A story behind the scandal –reports on the politicians who cavorted with Jack Abramoff, and those he paid for their influence. 2006: The growing corruption scandal of Illinois Governor George Ryan's administration. 2006: The discontent of Illinois voters as they discover that they replaced one corrupt governor (see Ryan, above) with another, Rod Blagojevich. 2007: Discusses the bribery corruption of Louisiana Representative William Jefferson. 2008: Mockery of the hiring of ex-Connecticut Governor John Rowland, by the city of Waterbury (CT), who was forced to resign as governor for taking bribes. IS MONTANA MORE CORRUPT THAN MIAMI?